This is a look back at a podcast I posted back in 2006. I can’t find the actual podcast. This is the script. The Wisconsin recall vote made me long for the days of William Proxmire. THE ANSWER TO CHANGE ALL THIS IS ONE MAN – WHO UNFORTUNATELY IS NO LONGER WITH US, BUT HIS MESSAGE AND SPIRIT REMAIN. HIS NAME IS WILLIAM PROXMIRE, THE LATE SENATOR FROM WISCONSIN. 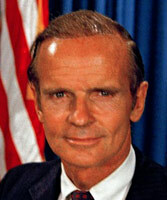 PROXMIRE DIED IN LATE 2005 FROM ALZHEIMER’S. SENATOR PROXMIRE WAS A HERO OF MINE. I NEVER LIVED IN WISCONSIN. I NEVER VOTED FOR THE SENATOR AND I NEVER HAD A CHANCE TO MEET HIM. BUT I LOVE WHAT HE STOOD FOR. AND IF MEMBERS OF CONGRESS WOULD RECALL WHAT PROXMIRE WAS ALL ABOUT — WE WOULD BE BETTER OFF. I WANTED TO MENTION SENATOR PROXMIRE RIGHT AFTER HIS DEATH, BUT I DECIDED THAT THERE WOULD BE A BETTER TIME TO USE SENATOR PROXMIRE’S EXAMPLE. IN HIS ARTICLE, UMHOFFER QUOTES PROXMIRE’S CHIEF OF STAFF FOR 14 YEARS. “He walked and ran the entire borders of the state” one year, said Ronald L. Tammen, Proxmire’s chief of staff. The idea, Proxmire said, was to build a personal connection to people so strong that it would not only guarantee re-election but free him from raising campaign funds that would indebt him to wealthy donors and special-interest groups. IN HIS LAST ELECTION, HE SPENT ABOUT A THOUSAND DOLLARS AND WON RE-ELECTION EASILY. THINK ABOUT IT. HE TRAVELS THE STATE AND CONNECTS TO PEOPLE AT A TIME WHEN CELL-PHONES WERE IN THEIR INFANCY AND THE INTERNET WAS JUST AN IDEA FOR REGULAR FOLKS. THINK ABOUT THAT. HOW MANY OF YOUR ELECTED OFFICIALS THINK YOU ARE THE BOSS – EVEN IF YOU DON’T DONATE TO HIS OR HER CAMPAIGN. To head off charges of hypocrisy, Proxmire pinched pennies on his office spending and refused to take taxpayer-funded trips abroad. He returned $1 million in unspent funds from his office during his time in the Senate. AND HE WOULDN’T BE INFLUENCED BY BIG BUSINESS. Proxmire, when he rose to lead the Banking Committee, refused to meet with the nation’s top bankers in his office. Senate colleagues, and members of his own party, wanted “Prox” to use his immense popularity to move the country on important issues. Urban officials — back home — moped about Proxmire’s refusal to carve some budget pork for the state. HAVE YOU EVER HEARD OF A POLITICIAN TODAY LIKE THAT? HE TRULY SERVED THE NATION – NOT JUST HIS CONSTITUENCY IN WISCONSIN. CONGRESS SHOULD HONOR PROXMIRE – NOT WITH A BIG PARTY OR A BUST. THAT IS NOT WHAT HE WOULD WANT. POLITICIANS CANNOT ASK FOR OR ATTAIN ANY CAMPAIGN DONATIONS. THEY MUST CAMPAIGN ON 5-THOUSAND DOLLARS OF THEIR OWN MONEY. THEY CAN TRAVEL THE STATE AND TALK TO PEOPLE DIRECTLY. THEY MUST USE A WEBSITE THAT OFFERS INSIGHT AND MESSAGES FROM THE CANDIDATE EVERYDAY. BROADCASTERS MUST OFFER FREE HALF-HOUR TIME TO POLITICIANS AT LEAST ONCE A MONTH DURING PRIME TIME. IF THIS WAS DONE, MAYBE WE WOULD GET SOME HONESTY IN GOVERNMENT. I AM NOT SAYING ALL POLITICIANS ARE CORRUPT, BUT I BELIEVE OUR SYSTEM ALLOWS TOO MUCH CORRUPTION. IF IT WORKED FOR WILLIAM PROXMIRE, IT CAN WORK FOR ANYONE ELSE. TELL YOUR ELECTED OFFICIALS TO USE WILLIAM PROXMIRE AS AN EXAMPLE – BEFORE YOU WILL VOTE FOR THEM.